Word of the Day: GETROUW, faithful – Welcome to the Direct Dutch institute, The Hague. In these hopeful days of spring you can hear the Dutch sing their national anthem ‘Het Wilhelmus’ on many occasions. ‘Singing’ does not really describe the act of murmuring and miming while they shamefacedly try to hide their ignorance. And yet… After having cheered the monarchy on King’s Day the Dutch mourn the victims of the second Wold War on the fourth of May and on fifth May they praise hard-won liberation, independence, and freedom. The anthem is sung and the word TROUW (loyalty) and its many derivatives can be heard in many speeches. In my previous posting I explored TROUW’s history and pointed out that TROUW, German ‘treu’ and English ‘true’ are closely related because they go back to the same source of fair and square stability. There is so much more to be said about TROUW and loyalty. It can be found in many ancient uplifting words like VERTROUWEN (confidence, faith), BETROUWBAAR (reliable), VERTROUWD (familiar) and in the idiomatic phrase ‘te goeder trouw handelen’ (act in good faith), just to mention a few words. In a negative sense there is nothing good about ONTROUW (infidelity) and WANTROUWEN (distrust, suspicion). 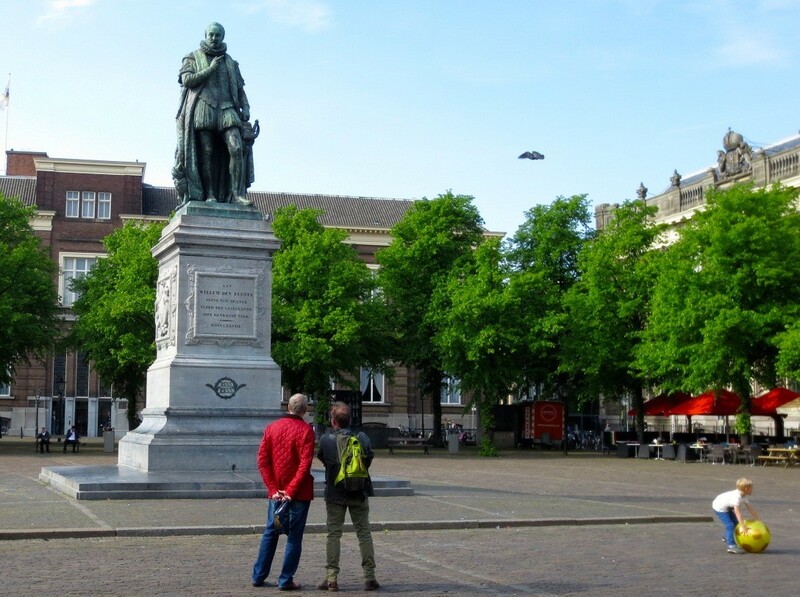 TROUW and ONTROUW are at the heart of the Dutch national anthem ‘Het Wilhelmus’. Even though the word ‘trouw’ only occurs four times in the lyrics. am I of Dutch and German blood. I will remain until in death). The word ‘Duits’ in the Dutch anthem is slightly confusing. ‘Duits’ here can refer to William’s German place of birth but in those early days it could also mean the countries where Dutch and German were spoken. See here. Actually, the Dutch anthem is a weird piece of poetry. Extremely weird. As you can see from the opening lines, the person who is supposed to be speaking is William of Nassau. This William is also known as the father of the fatherland (de vader des vaderlands) and his full name is Willem van Oranje Nassau ((1533-1584). I very much doubt if there is another anthem which has the shape of a long monologue or soliloquy. The ruler of the new Dutch nation wants it known that he has always honoured the King of Spain? Always? But now no more! The last line is a terrific cliff hanger. You can feel in your bones that something went wrong in the relation between the Spanish King and the Dutch William who used to be his friend and private councillor from 1555 until 1559. The plot sounds like a Shakespearean historical play. What pity that Shakespeare was not interested in the Dutch situation. The Bard would have made an exciting drama of the fight between the Catholic King Philip and the Protestant Prince William. So every time we cherish our national feelings and feel united, we sing this song of the great liberator who was born in Germany, spoke a lot of French and started the new nation. A long song of a hard struggle against tyranny. On you I want to build my trust, do not leave me nevermore.